“Life and Beauty”, 22″x28″. Oil on canvas. This was a commissioned piece that I just finished last weekend and finally sent off to the client two days ago. It’s going to be auctioned off at a fundraiser to raise money for the Amarna Project, an organization that promotes the study and preservation of the ancient Egyptian city Tell el-Armarna. 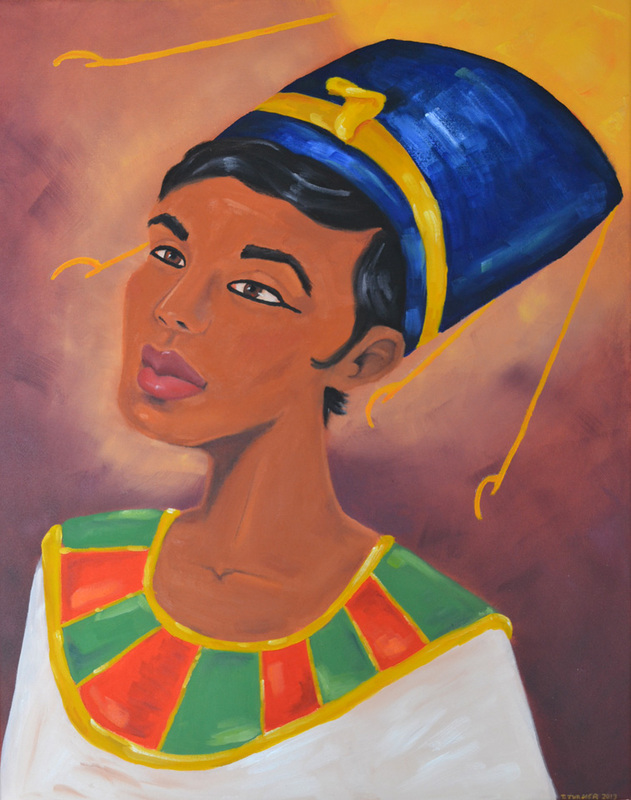 Within the perimeters I was given for the piece, I decided to make my own version of Queen Nefertiti with the sun god, Aten, in the background. Believe it or not, the opportunity was posted on Craigslist! My coworker sent it to me. (It helps to tell people about your artistic aspirations! You never know who will be willing to help you out.) I don’t have a personal artist website set up yet, but I sent the contact the link to my work on this blog and voila – I was in business. It was the first time I ever had to sign a real artist commission agreement. I’ll even get to take home a percentage of the sale at the auction, which is a luxury when donating work to a fundraiser. As easy as it was to obtain the commission, actually painting this piece was a challenge for sure! This was ambitious for me because it’s bigger than I normally work, and it’s a portrait for which I had no visual reference. I wanted to just work from my head. Needless to say, the vision in my head was a bit different than how it was shaping up while I was painting. I reached a point in the middle where I really became frustrated and couldn’t even look at it. I just couldn’t get the skintones to work the way I wanted for the life of me. Through a bit of trial and error, somehow I pulled myself together and pushed through it and I’m quite satisfied with how it turned out.